Objectives The gut feelings of doctors can act as triggers and modulators of the diagnostic process. This study explored the existence, significance, determinants and triggers of gut feelings among Spanish general practitioners. Design Qualitative study using focus groups. Thematic content analysis. Setting Primary healthcare centres in Majorca (Spain). Participants 20 purposively sampled general practitioners working in Majorca. Results General practitioners were aware of the existence of gut feelings in their diagnostic reasoning process and recognised 2 kinds of gut feelings: a sense of alarm and a sense of reassurance. A previous physician–patient relationship and the physician's experience had a strong perceived influence on the appearance of gut feelings. The physicians attached great significance to gut feelings, and considered them as a characteristic of the primary care working style and as a tool available in their diagnostic process. The physicians thought that the notion of gut feelings and their relevance can be transmitted to students and trainees. They tended to follow their gut feelings, although they were not sure of their accuracy. Conclusions Spanish general practitioners in our study recognise the presence and role of gut feelings in their diagnostic reasoning process. Future research should examine the diagnostic accuracy of gut feelings and how to teach about gut feelings in the training of general practitioners. This is the first study to examine diagnostic gut feelings in a Spanish-speaking area. The qualitative approach used here provides information about the existence, significance, determinants and triggers of gut feelings among Spanish general practitioners. Our study sample was heterogeneous in age, experience, gender and location of practice, and the consensus was wide and rapidly achieved. The analysis was performed by three researchers to assure the validity of the results. The aim of this study was to explore the existence, significance, determinants and triggers of GFs among Spanish GPs. We used a study design similar to the previous Dutch researchers to allow direct comparison of the results. Our work focuses on opinions and feelings, so we chose a qualitative approach.26 GFs can be difficult to characterise, because personal experience has a major effect, and there has been little research on GFs in Spanish-speaking countries. All the researchers of the present study have previous training in qualitative research. We used the focus group approach over individual interviews to take advantage of the interactions between members of the focus group as a tool to stimulate individual discourses.26 ,27 We used purposive sampling to recruit participants to achieve a representative distribution of the factors we wanted to study, such as experience, gender, dedication to GP traineeship, and rural or non-rural practice location. All selected GPs worked for the Majorca Primary Care Department. Previous research indicated that clinical experience seemed to be a major determinant for GFs. Thus, we separated experienced GPs (more than 10 years of experience beyond residence) from less experienced GPs.21 A 10-year cut-off point was selected according to the 10-year rule.28 We contacted 12 GPs in each group by telephone or mail, and sent written confirmations after their acceptance to participate. No relevant information on the topic of discussion was released to reduce bias, and none of the GPs was remunerated for their collaboration. Focus groups were organised in the Majorcan primary care practices that were more geographically accessible to the participants in each group. The day before the second group was scheduled to meet, there was a fire in the health centre. Thus, four of the GPs did not attend the group, as they thought it was suspended. BO, SM and ME organised the meetings and acted as moderators and observers. We prepared a written scenario in advance (box 1) to introduce the topic of GFs at the beginning of the group meeting, and to assure that all issues were discussed during the meeting. We then let the GPs talk about their experiences. The researchers, acting as moderators and observers, compared their notes about each meeting after it ended. All points of interest that were prepared in the script were discussed in the first group. An issue was raised during the first group regarding GFs in nurses, patients and relatives, so this was added for the second group; another issue regarding GFs in non face-to-face consultations was raised in the second group, and this was added to the third group. Oral acceptance for participation and audio recording was obtained from each of the participants after introduction of the objectives of the focus groups. The focus groups were audio recorded and then transcribed. The duration of the meetings was 60–70 min. The aim of this study is to gather information about how the diagnostic process works in primary care. You were trained as doctors to make diagnostic decisions through questions, explorations and algorithms; that is, rational decision-making. That part is known. However, we do know that when making decisions, doctors also consider other things. Let us say that sometimes there are certain feelings and previous experiences that alert us. In the English language medical literature, we talk about ‘gut feelings’. 1. What can you tell us about gut feelings? 2. Have you ever previously felt something like a gut feeling? 3. How would you describe it? What do you feel? 4. What would you call them? 5. How do we view these gut feelings? 6. Do you follow gut feelings? What makes you listen to them or not? 7. What triggers these feelings? 8. Are there any symptoms, diseases, types of people, days or situations in which you are more likely to have gut feelings? 9. Do you think gut feelings are related to professional experience? To knowledge (patient or medical)? To gender? 10. Do gut feelings depend on the type of consultation (by appointment vs emergencies), time (normal consultation vs off-hours) or location (rural vs urban)? 11. (If there was no mention of the two types of gut feelings) Research shows a distinction between gut feelings that provide a sense of alarm and a sense of reassurance. What do you think? Do you recognise both types? Do you think such a distinction is useful? 12. Have you ever had feelings of unwarranted security? 13. Could this be taught to trainees or students? How? 14. What relevance do you give to these feelings in the context of primary care? 1. Do you pay attention to the gut feelings of patients, relatives or other healthcare professionals? 1. Do you also have gut feelings in non-face-to-face consultations (by telephone or email)? After the second group, we decided there were not enough GP trainers. We wanted GP trainers and young GPs to be well represented in our groups to discuss the teaching of GFs. Thus, we organised a group of GPs who were trainers for at least 4 years (a complete training period) and GPs who had recently completed their specialty training. After analysis of the third group, we agreed that no relevant new information was detected and considered that the information obtained had reached saturation. Table 1 shows the characteristics of the GPs who attended the focus groups. There were physicians from seven regions of Spain and from three different Spanish-speaking countries. BO, SM and CG performed a thematic analysis of the transcripts immediately after the first focus group.26 ,29 The researchers individually selected quotes related to the research questions from the transcripts and assigned codes to them. The coding was mainly deductive, based on previous research, although it also allowed debate and the use of new categories.21 ,22 This analysis employed the TAMS Analyzer software. Then a meeting was held to discuss the quotes and the codes that were used. Agreement was reached on the quotes, codes and certain categories in which the codes were included. In cases of disagreement, ME and ES made the decision. We obtained 59 codes after analysis and coding of the transcripts. We grouped these codes into 13 first-level categories and 4 second-level categories: GFs existence and characteristics, influencing factors, consequences and significance. Table 2 shows the resulting code tree. Numerous factors are linked to the onset of GFs, and these factors are related to the patient, the physician, the context in which the consultation occurs and the existence of a previous doctor–patient relationship. The Spanish GPs in our study recognised the existence of GFs in their own diagnostic processes. In particular, they recognised two kinds of GFs: a sense of alarm, when something does not fit in the patient; and a sense of reassurance, the feeling that nothing serious will happen. The two factors with the strongest influence on the appearance of GFs are continuity of care in the patient–physician relationship, and amount of professional experience. The GPs in our study attached great value to their GFs, and considered them an important tool for carrying out their tasks, and even one of the main characteristics of working in a primary care setting. The GPs that we interviewed said that GFs cannot be directly taught during training, but the notion of GFs and their relevance can be transmitted to students and trainees. The GPs felt comfortable about considering their GFs during diagnosis, but were unsure of their accuracy. Thus, the GPs considered GFs as one of the tools available when deciding whether to begin a diagnostic process or to adopt a wait-and-see attitude. Figure 1 summarises the main discourses around GFs and how factors related to GFs appearance and the relevance given to them influence the diagnosis process. Factors and significance of gut feelings among Spanish general practitioners. We found no effect of gender or previous medical experience on the discourses of the GPs we examined. In fact, all the GPs in our study had experienced GFs during their work. Experienced GPs had more confidence in their GFs than less experienced GPs. Our use of a focus group study enabled us to select physicians with the characteristics we wanted. We found a wide consensus among GPs who had different years of experience, gender, teaching profiles and practice locations. Saturation of information was quickly reached. Although our research was performed on the island of Majorca, where the languages of Spanish and Catalan coexist, we believe that the GPs interviewed in our study are representative of Spanish GPs. Physicians and patients use both languages in most practices. The organisation of medical practices and GP traineeship is very similar throughout Spain. There is no School of Medicine in Majorca, so GPs working in Majorca have all studied medicine elsewhere in Spain, and have the same medical culture as residents of the Spanish mainland. The GPs that we interviewed, and GPs in general, who work in the Majorca Primary Care Department, are born and raised in almost every region of Spain and Spanish-speaking South American countries. The results of this study suggest the presence of GFs in Spanish doctors, and our findings are in agreement with studies of doctors from elsewhere in Europe. Future research on the GFs of doctors in Spain should seek to evaluate their diagnostic accuracy. Since Spanish GPs have a similar GF to the Dutch concept where the Gut Feeling Questionnaire originates, we can proceed to translate and make the linguistic validation of the Gut Feeling Questionnaire to Spanish, and use it to determine the presence and accuracy of GFs. In the few quantitative studies conducted on GPs' suspicion of cancer or serious illness after a consultation, the negative predictive value of suspicion was high and the positive predictive value was moderate, but these were comparable to the predictive values of the main ‘red-flag’ symptoms.15 Once we know the diagnostic accuracy of GFs, it may be possible to develop and assess teaching strategies. Spanish GPs in our study recognised the presence of GFs during the diagnostic process. There were two main types of GFs: a sense of reassurance and a sense of alarm. The former is more common, but both are useful for discriminating between patients according to disease severity, an important goal in primary care. The GPs reported that clinical experience, duration of the patient relationship and frequency of patient contact were the main factors related to recognition of GFs. The authors are grateful to the GPs who formed the focus groups and the Health Centres that allowed use of their facilities.
. Clinical problem solving and diagnostic decision making: selective review of the cognitive literature. BMJ 2002;324:729–32.
. Five pitfalls in decisions about diagnosis and prescribing. BMJ 2005;330:781–3.
. Surgical intuition: what it is and how to get it. Hanley & Belfus, 1995.
. The consultation process. In: Sheldon M, Brooke J, Rector A, eds. Decision-making in general practice. London: Macmillan Education UK, 1985:13–26.
. 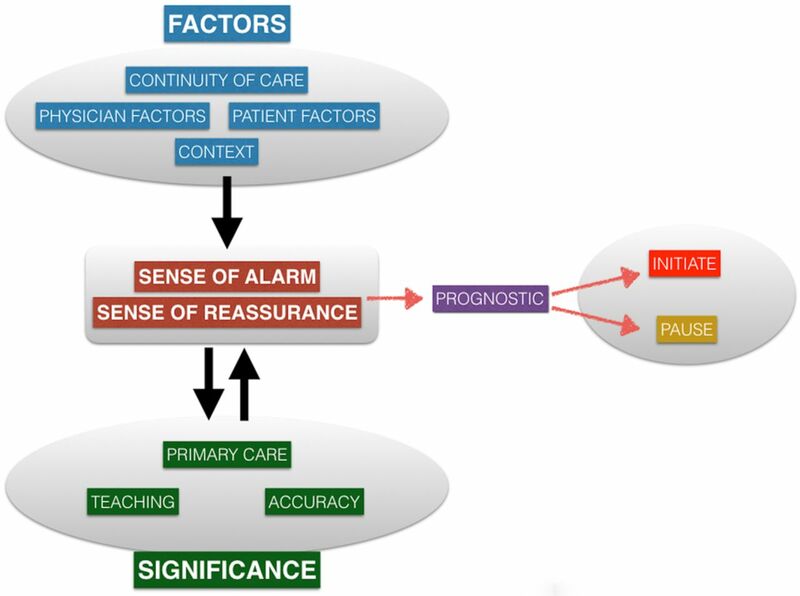 The ‘sense of alarm’ ('gut feeling’) in clinical practice. A survey among European general practitioners on recognition and expression. Eur J Gen Pract 2010;16:72–4.
. The transculturality of “gut feelings”. Results from a French Delphi consensus survey. Eur J Gen Pract 2013;19:237–43.
. Basics of qualitative research: techniques and procedures for developing grounded theory. SAGE Publications, 1998.
. Using and analyzing focus groups: limitations and possibilities. Int J Social Res Methodol 2000;3:103–11.
. The influence of experience and deliberate practice on the development of superior expert performance. In: Ericsson KA, Charness N, Feltovich PJ, Hoffman RR Eds.The Cambridge handbook of expertise and expert performance. Cambridge University Press, 2006:683–704.
. Demonstrating rigor using thematic analysis: a hybrid approach of inductive and deductive coding and theme development. Int J Qual Methods 2008;5:4.
. The power of intuition: how to use your gut feelings to make better decisions at work. Random House, 2003. Contributors The study was conceived and designed by BO, SM and ME with support from ES. Focus groups were organised by BO, SM and ME. BO, SM and CG conducted the analysis. BO led the writing guided by SM and ME, with additional comments from ES. All authors read and approved the final manuscript. Funding This work was supported by the Majorca Primary Care Department grant PI004/16. It also received funding support from the Network for Prevention and Health Promotion in Primary Care (redIAPP, RD12/0005/0011) cofinanced with European Union ERDF funds and the Carlos III Health Institute of the Ministry of Economy and Competitiveness. Ethics approval The study was evaluated and approved by the Majorca Primary Care Department Research Committee. Data sharing statement Full transcripts of the focus groups and quotes and authorisation of the study are available by email from the corresponding author.